There are few moments in modern history where you know everyone in the world is watching the exact same thing unfold as you are. Yesterday? It was word that one of the most historical buildings in the world was burning: the Notre Dame cathedral in France. As pictures of the devastation flashed across screens, social media was also convulsing in shock and grief. 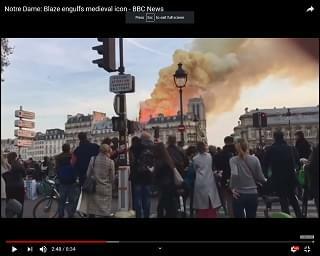 While the cause of the blaze is still unknown – though believed to be accidental at this point – the world was as transfixed on their screens as those in Paris were to the real thing, watching as an 850-year-old building that has withstood French Revolution and two World Wars fell to fire. If there’s good news, it’s that the fire is out – and that some of the most precious religious relics are safe – including the ‘Crown of Thorns’ believed to have been worn by Jesus at his Crucifixion. The bad? The entire wooden interior is gone. Still, the damage is significant – the famous spire is gone and the roof has collapsed. And a world where the next is “how will they rebuild,” that effort is already underway. French billionaire Francois-Henri Pinault has pledged more than $130-million to rebuild the iconic cathedral. Pinault, who is married to actress Salma Hayek, is the CEO of the group behind names like Gucci and Yves Saint Laurent, among others. It won’t be a solo effort, of course – French President Emmanuel Macron has also vowed to rebuild. Much like average folks, celebrities took to the Internet to share their reactions to the destruction – see some of those HERE.